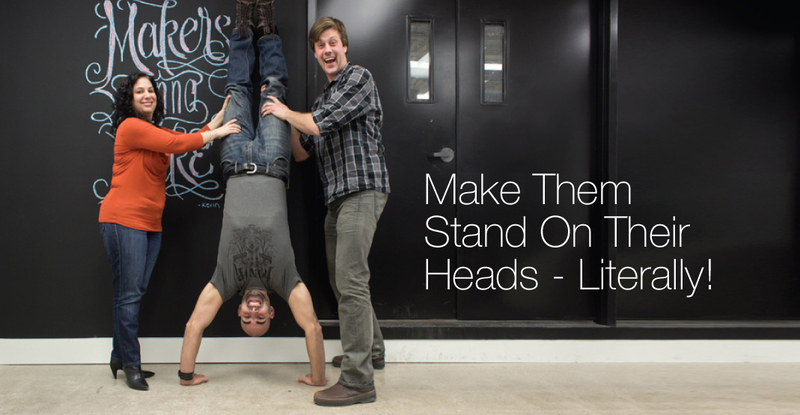 ﻿ Make Them Stand On Their Head - Literally! We live in a world full of devices that tend to keep us apart. Every year amazing advances in technology afford us new opportunities – such as seeing our loved ones face when we speak across great distances. Cloud computing provides the opportunity to share documents and work collaboratively despite being miles away from each other. There’s even well established technologies designed to help hold meetings with those in your office while you are on vacation. Forget all of that and create collisions. What do I mean by creating collisions? I’m saying make it a priority to be in the same physical space and have the team collide physically and emotionally in each other’s company. Every year we host a Leadership Conference; this year it was on Thursday, December 7. We do this to wrap up the past year as well as to create a powerful year ahead. What were our wins and what are we most proud of? What didn’t we do and why? How are we going to do it differently next year? We believe in bringing people together from all sections of our business to create and design our future. It’s a chance to assess the leadership team and to express our belief in them. It’s also hard to deny how powerful people are in numbers. 1. Location, location, location! Do you think that you need to rent a conference room at a fancy downtown hotel? How about shuttling everyone to some scenic resort in a beautiful rural setting? Rid yourself of the notion that you need to go somewhere “special” to host your Leadership Conference; you already have a “special” place ready to accommodate you. I recommend hosting your event onsite. Doing so will send a powerful message to your team that you can have fun and work at the same time. Not only does it save money and exemplify that you can “do more with less”, but your entire team, including those not participating in the conference will know something special is happening. You will find that the energy will become contagious! 2. Define your purpose and determine language! Prior to the event, send those attending an outline of the conference and ask them to prepare a few items, we call them “committables”. Outline what you will accomplish and attach a sense of purpose to the meeting. We even go as far as to define the words we will use! There’s no “I don’t, I can’t, I hope ore even maybe” being said at our conference. Instead we emphasize terms like “together and inspire,” doing so really sets the stage for how your meeting will go. 3. Remember to have fun! If you’re asking people to convene for 10 to 12 hours, you’d better have some truly engaging and memorable moments for everyone to share. We pump upbeat music, chalk presentations full of pop culture multimedia and set the stage for WOW moments to occur. This year, we held a scavenger hunt, a ceremonial bonfire and parade; all of which got people out of their chairs, interacting with team members they don’t usually interact with and promoting those “collisions” I wrote about earlier. 4. Create WOW moments! Every event needs at least one. That universal moment that everyone will remember for years to come. There’s no preordained path to achieve these moments and they should come organically, but you can set the conditions to nurture and promote WOW moments. Ours came when we saw the happy, surprised faces on our team members as we paraded through their workstations thanking them for their hard work and dedication. Other WOW moments came when we all shared personal goals. I was pleasantly shocked at how open our leaders were once we let them know it was ok to share! 5. Together, create committable action items. Why did you have people travel great distances to attend? Why did they clear their schedules to be part of your conference? Having your leadership team in one room is an amazing opportunity to create solid action items that will shape the year ahead. Make sure that everyone walks away with a sense of purpose and knowing what to do in order to accomplish the goals you set throughout the conference. I trust the above points are useful in planning your upcoming conference. We had an amazing time at ours and are already looking forward to next year’s! • Ask for testimonials throughout the event to gauge the energy from the morning until completion. Not only will this provide an indication of how people are feeling about the conference, but they can be used to plan the next one. • Celebrate with a toast. It signifies a salute to each other and who doesn’t want to have a toast after a 12-hour day. Check out the video below for a glimpse at our 2013 Leadership Conference! Incorporate the above and you’ll be sure to WOW ‘em! Cool! Awesome blog Tony. I’ve experienced the passion! What an awesome day it was. Great experiences with great people! Great Conference with some memorable moments! Thanks for sharing with everyone! Great advise, much of it can be used in our day to day lives as well. Amazing!!! Wow! Incredible revving up for an amazing 2014! Great experiences with great people! This looks amazing! I have heard amazing things about the conference! Thanks so much for your tips and insight!! Wow, you make me wish I was at the meeting! Beautifully said! as this this weeb page conaations in fact good funny stuff too. browsing your blog posts. After all I will be subscribing to your feed and I hope you write again soon! a great process in this topic!